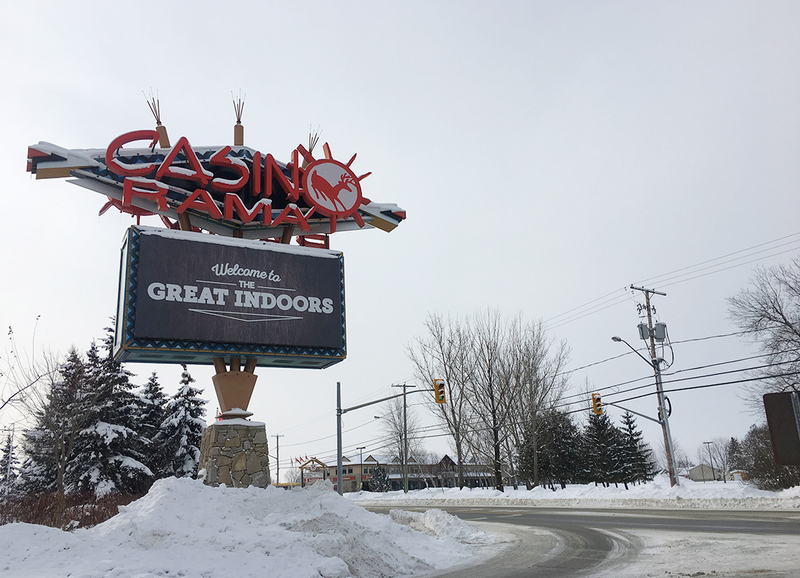 Winter Wonderland: Our Stay at Casino Rama Resort! Although our recent trip to Ontario’s Lake Country was all about winter activities in the great outdoors, we needed a home base for the evenings after a long day of winter activities and shopping, and a place with comfy beds for a good night’s sleep. We wanted a place to relax, unwind, eat great food, and stay in one room as a family. The all-suite rooms at Casino Rama Resort was our first choice. What better place than the great indoors! We have stayed at Casino Rama Resort many times before, and each time we stayed, we left happy, relaxed, and rejuvenated. When we arrived, it was -24 degrees celsius, -32 with the windchill factor. The thought of trecking all of our luggage through the parking lot in these temps was not appealing. So, I pulled right up to the front doors of the hotel, we unloaded our bags onto a porter cart, I handed my keys to the valet, he gave me my valet ticket, and we walked into the hotel. Our bags were delivered to our rooms shortly after checkin. When we would go out, I would call down for them to pull up my truck, and by the time we were dressed and down in the lobby, my truck was waiting for us at the front door, all warmed up. Sorry Charlie Sheen, but that’s #winning. Stay at Casino Rama Resort! Walking in to the resort is breathtaking… from the high vaulted ceilings to the warm cottage feel, you are made to feel welcome. At Christmas time, it is fully decorated with trees and festive cheer. Check in is fast and easy. Just have your credit card and ID ready, and they take care of the rest… efficiently. Our room had two double beds, a pullout couch, a big screen TV, a lounge chair, and a coffee maker. The washroom had a large sink with a bathtub and a walk-in shower. There is also a combination safe in the closet to keep all of your valuables secure. The room is big enough that you never feel you are stepping in each other’s way. Just the right size. We knew we would be eating at several places, and trying out different types of foods, so we asked for a small fridge to be delivered up to our room upon checkin. It was brought up about 10 minutes after we arrived at our room. It was great having the pullout couch – it allowed us to open it up and relax while watching movies after a long day of winter activities. One of the highlights of our stay at Casino Rama Resort is always spending some time int he indoor horizon pool. it is big, warm, a consistent depth, and has several chairs, couches, and loungers around the deck. Rachel and Lauren always have a blast in the pool. We took our GoPro camera with us this time. They filmed lots of fun videos to share on their Instagram channels. We loved our stay at Casino Rama Resort! Spending 3 days bonding and doing fun activities as a family was just what we needed. It was everything we wanted in a mini vacation. If you are planning a mini getaway up to Ontario’s Lake Country, give Casino Rama Resort a try. It’s not all about playing the slot machines… there is so much more to experience at this awesome resort. Casino Rama is located at 5899 Rama Rd in Rama (just over an hour north of Toronto). Get Social with Casino Rama! Be sure to follow Casino Rama on Facebook, Twitter, Instagram, and YouTube. Disclaimer: Our accommodations were covered and organized by Casino Rama Resort. All opinions are my own. It was really cold, but the room was cozy, and there is so much to do at Casino Rama. The spa is beautiful, the steam room and sauna are nice after a swim in the saltwater pool.